Tomatoes are delicious and easy to grow in your greenhouse or backyard, but they are susceptible to a number of problems. When troubleshooting your tomatoes, keep in mind that many diseases and pest infestations share the same or similar symptoms. Precisely identifying the cause of the symptom is key to successfully treating the problem. This fungal disease announces itself with small black spots on the leaves that develop light-colored centers. Eventually the spots turn white or gray with a dark-colored margin and a black dot in the middle. You'll see them first on the bottom leaves before they progress up the plant. A mild case may turn severe in wet weather. To control septoria leaf spot, ensure good air circulation between plants by spacing them well. Overhead irrigation should be avoided. Remove infected leaves from living plants. Clean up all diseased plant tissue from the ground to prevent the fungus from overwintering on the debris. Don't compost any infected parts. In the case of a heavy infestation, sulfur dust may help to protect new leaves. The fungus Fulvia fulva causes a condition called "leaf mold," which begins as white spots on the upper surface of older leaves. These spots rapidly enlarge and yellow, and the lower surface of the leaves underneath the fungal spots develop a velvety, olive-brown growth. Ample ventilation and good air circulation in the greenhouse can help keep leaf mold under control. Maintain a temperature of between 60 and 65 degrees Fahrenheit. At night, when air temperatures drop below this range, heat the greenhouse to combat the nighttime humidity increase. When stink bugs feed on your tomatoes, they leave indelible marks just underneath the skin of the fruit. On green fruit, these begin as dark pinpricks surrounded by lighter discolored areas. As the fruit ripens, the areas may turn yellow or cloudy white, or they may remain green. Underneath the spots, the fruit tissue will be white and spongy, and cavities may form. 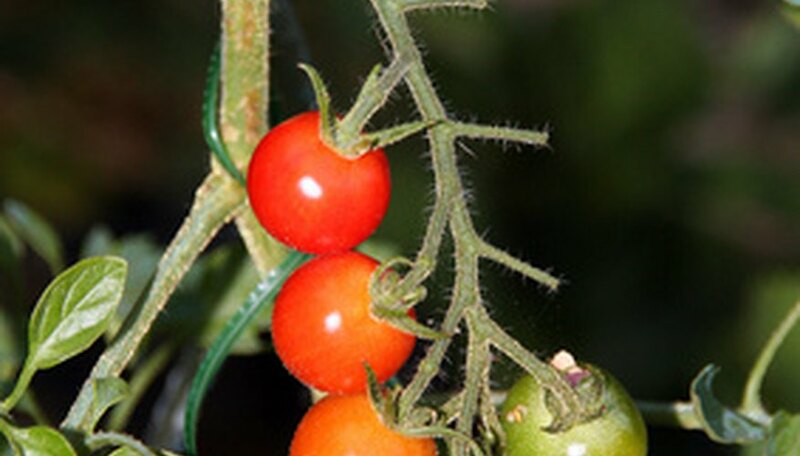 Control weed growth tightly near your tomatoes. That's where stink bugs overwinter. Rob them of their weedy habitat and they'll be less likely to nibble at your crop.